Dress: 100% Polyester, Gloves: 87% Polyester, 13% Elastane, exclusive of trims. One of the most iconic and evil villains of the Disney world, Cruella De Vil is the fur loving nasty from the Disney movie 101 Dalmatians, you can now replicate her style in this fabulous, Disney licensed Cruella De Vil Costume from our Disney collection. 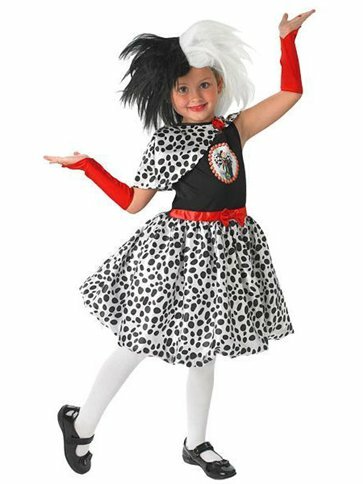 This distinctive 101 Dalmatians three piece costume features a sleeveless dress with stretch fabric bodice and character print to chest, red ribbon trim to waist and white skirt with black spotty print. Also included is a matching satin cape with Velcro fastening to neckline and a pair of glamorous red glovelettes complete with finger loops. Just need to practise your evil laugh ! Want it Friday, 26 April? Order it within 16hrs and 4mins and choose Premium by 9pm Delivery at checkout.